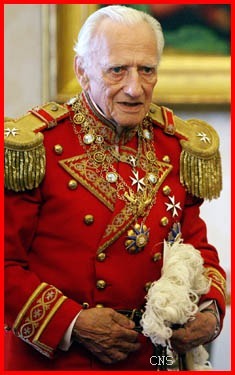 I’d like to begin this week’s post marking the recent passing of two men who made important contributions to the Catholic Church: Fra’ Andrew Bertie of the Order of Malta and Eduardo Bonnin, founder of the Cursillo movement. Both passed away last week. We met Fra Andrew Bertie, Prince Grand Master of the Order of Malta, last year during our trip to Lourdes with the Knights. He was already experiencing health problems at the time but tried to remain very active. 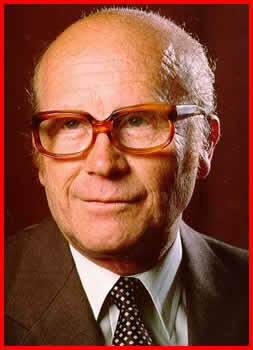 He was a great promoter of the works of mercy and evangelization that the Order of Malta is so dedicated to. Fra Bertie was a consecrated religious, which is required for heads of the order, and he was a descendant of the House of Stuart, a very historic Catholic family in the United Kingdom. Many of the important Catholic monarchs around the time of the Reformation were Stuarts, including Mary Queen of Scots. Here in the archdiocese we have a very active community of the Order, and I am sure that everyone will be offering prayers for him and for the election of his replacement. We are arranging with the Knights the celebration of a memorial Mass in Boston, but the date is not set yet. Eduardo Bonnin, from Mallorca, Spain, was an outstanding layman whose life was certainly dedicated to the wonderful Cursillo movement, which has formed so many Catholic leaders in the Church. In many of our parishes, the catechists, parish council members and other active pillars are cursillistas. Many of our permanent deacons first began their journey toward ministry as cursillistas. Cursillistas are also doing wonderful work in the prisons and in many other different ministries. Cursillo is a wonderful opportunity to experience the life of grace and to receive all at once a whole vision of the Catholic faith. Many people never have that opportunity; rather they get information about the faith piecemeal over the years. To be exposed to the Church’s teaching on the sacraments, the life of grace and to experience that sense of community that the cursillistas have is a great gift and has transformed many people’s lives. There are regular Cursillos for men and women at St. 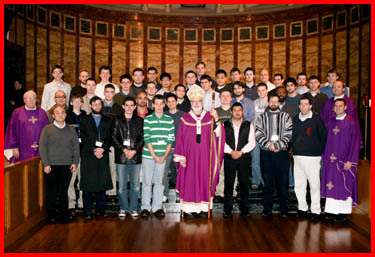 Basil Seminary in Methuen and at Stonehill College in Easton. We certainly encourage people to make the Cursillo. The word “Cursillo” means, “little course.” The Cursillo is a “little course in Christianity,” it is an encounter with Christ in a small community of the Church so that his love and grace can be brought to every aspect of life. Cursillo began in Spain in 1949 when Bishop Juan Hervas invited Eduardo Bonnin and other leaders of Catholic Action to assist in the work of spiritual renewal, in time the movement has spread throughout the world. In a fuller sense, Cursillo is an experience of people gathered into a small community by Christ to promote their growth in grace and to intensify their ability to be His witnesses in the world. 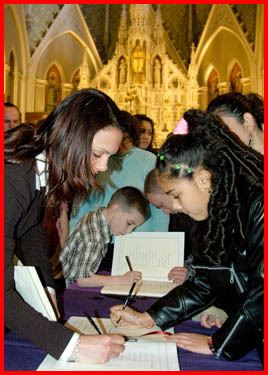 In the Archdiocese of Boston, Cursillo is offered in Portuguese, Spanish, Vietnamese and English. The Office of Worship and Spiritual Life oversees the English Cursillo Movement. 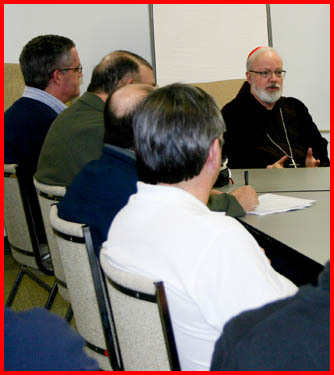 The English Cursillo weekends take place at the Marist Retreat House in Framingham, MA. For more information about the program, you can contact the Office of Worship and Spiritual Life at 617-779-3640 or via email at spiritual_development@rcab.org, or go to the Archdiocese of Boston Cursillo Website at www.bostoncursillo.org. We will also be having a Mass for the repose of Eduardo’s soul with the cursillistas of Boston in the near future. Last weekend we had two vocational retreats, one at St. John’s Seminary in Brighton and the other at Blessed John XXIII National Seminary in Weston. 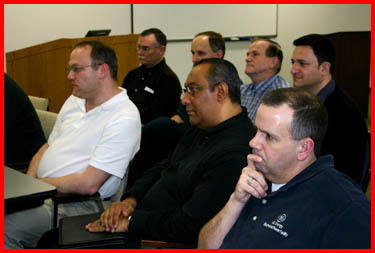 Each year at this time we have retreats like these for men who are considering the possibility of entering the seminary. They give them the opportunity to experience a little bit of seminary life. The Blessed John retreat was held first, and a couple of men attended. They were able to live with the seminarians and go to some of the classes. 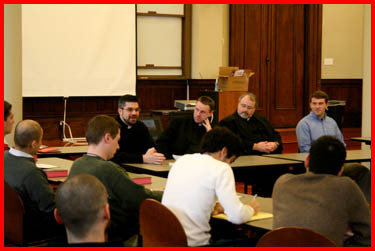 At St. John’s, over 40 college men attended. The event had much more of a retreat format, but also gave the men the opportunity to experience seminary life and to reflect on what God is calling them to do in their lives. I was very pleased with both retreats and am very grateful to our vocation team as well as all the pastors and those in campus ministry who helped us bring the retreat about. That weekend I was visited by a young couple, Francis Suarez and his wife Gloria, who are from Miami. I had baptized him, married his parents and married the two of them just last summer. He is going to be running for office in Miami. His father was the mayor there. We are very happy when committed Catholics choose that path of public service, especially when they are guided by their ideals and the Catholic social teachings. 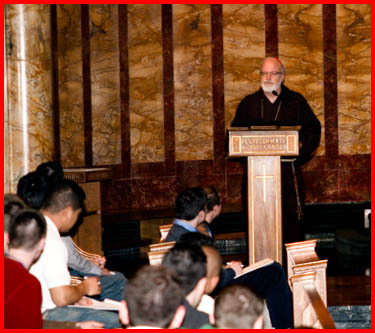 In the afternoon on Sunday, we had two sessions of the RCIA program’s Rite of Election. The cathedral was filled with people from the parishes, accompanying those who are preparing for baptism or for full communion at Easter time. The rite is always a very joyful and wonderful experience and a very important part of the RCIA program. The candidates and catechumens come to the Cathedral of the Holy Cross for the ceremony, and it is an opportunity for them to see their bishop as a symbol of their unity with the local church. Being in the cathedral is a very stark reminder that these new Catholics are not just joining their parishes; they are joining the larger Church — both the diocese and universal Church. In the early Church, the bishop baptized everyone, but now the bishop performs the confirmation, which is in a sense the completion of baptism. Two of the parishes in Lawrence always have the largest groups, and this year St. Mary of the Assumption with pastor Father Jorge A. Reyes had about 60 people, and Father Paul O’Brien from St. Patrick Parish also had a very large group. We certainly want to encourage all of those working in the RCIA program. It is an opportunity for the whole parish to be reminded of our missionary nature as the Church and the need that we have to be a welcoming and inviting community. Bishop Thomas Tobin of Providence, Rhode Island, came to St. John’s on Monday to preach at the vespers and holy hour. 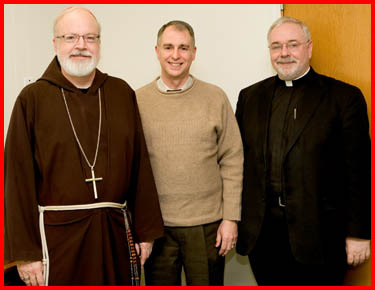 He and the rector of his college seminary, Our Lady of Providence, also stayed for dinner. 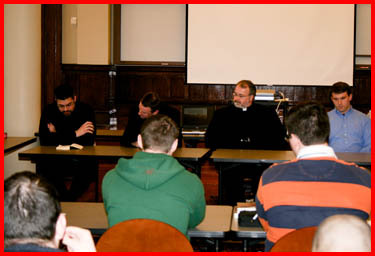 Several of our seminarians are studying at Our Lady of Providence and we look forward to sending more. On Wednesday, I met with the permanent deacons’ community board, which meets six times annually. Deacon Leo Donohue heads up that office, and recently we have brought in others to help him — Deacon Patrick Guerrini and Mary Reardon, SND, so he can focus on the formation of the new candidates to the permanent diaconate. Deacon Guerrini is now responsible for the life and ministry of the ordained deacons, including their continuing education and sister Mary is working with the wives of the deacons and their families. I’m sure they will be of great assistance to him because we are expanding the diaconate program so that there will be a new class each year rather than every other year. We will also have two sites for the classes, one will be the new pastoral center in Braintree and the other will be at Austin Preparatory School in Reading to accommodate candidates who live north of the city. 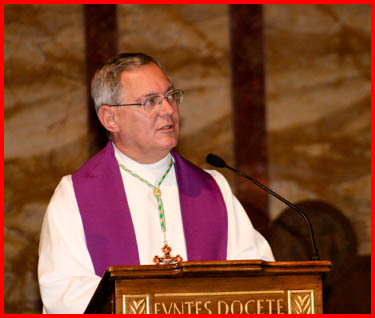 During the meeting, Deacon Leo shared with us the text of the Holy Father’s remarks on the permanent diaconate made during a question and answer session with the clergy of Rome at the start of Lent. I’d like to share that text with you, as well. Holy Father, I would like first of all to express my gratitude and that of my brother deacons for the ministry that the Church so providentially has taken up again with the [Second Vatican] Council, a ministry that allows us to fully express our vocation. We are committed in a great variety of works that we carry out in vastly different environments: family, work, parish, society, also the missions of Africa and Latin America — areas that you indicated for us in the audience you granted us on the occasion of the 25th anniversary of the diaconate of the Diocese of Rome. Now our numbers have grown — there are 108 of us. And we would like for you to indicate a pastoral initiative that could become a sign of a more incisive presence of the permanent diaconate in the city of Rome, as it happened in the first centuries of the Roman Church. In fact, sharing a significant, common objective, on one hand increases the cohesion of diaconal fraternity and on the other, would give greater visibility to our service in this city. We present you, Holy Father, the desire that you indicate to us an initiative that we can share in the way and the manner that you wish to specify. In the name of all the deacons, I greet you, Holy Father, with filial affection. Thank you for this testimony as one of the more than 100 deacons of Rome. I would like to also express my joy and my gratitude for the Council, because it revived this important ministry in the universal Church. I should say that when I was archbishop of Munich, I didn’t find perhaps more than three or four deacons, and I very much favored this ministry because it seemed to me to belong to the richness of the sacramental ministry in the Church. At the same time, it can equally be the link between the lay world, the professional world, and the world of the priestly ministry — given that many deacons continue carrying out their professions and maintain their positions — important or those of a simple life — while on Saturday and Sunday they work in the Church. In this way, you give witness in the world of today, as well as in the working world, of the presence of faith, of the sacramental ministry and the diaconal dimension of the sacrament of Orders. This seems very important to me: the visibility of the diaconal dimension. Naturally as well, every priest continues being a deacon, and should always think of this dimension, because the Lord himself made himself our minister, our deacon. We can think of the gesture of the washing of the feet, with which he explicitly shows that the master, the Lord, acts as a deacon and wants those who follow him to be deacons, that they fulfill this role for humanity, to the point that they also help to wash the dirtied feet of the men entrusted to us. This dimension seems very important to me. On this occasion, I bring to mind — though it is perhaps not immediately inherent to the theme — a simple experience that Paul VI noted. Each day of the Council, the Gospel was enthroned. 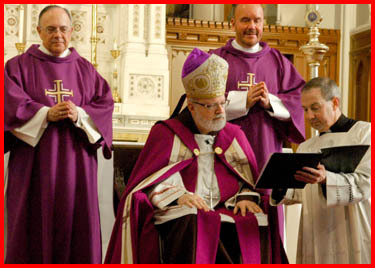 And the Pontiff told those in charge of the ceremony that he would like one time to be the one who enthrones the Gospel. They told him no, this is the job of the deacons, not of the Pope. He wrote in his diary: But I am also a deacon, I continue being a deacon, and I would like to also exercise this ministry of the diaconate placing the word of God on its throne. Thus, this concerns all of us. Priests continue being deacons, and the deacons make explicit in the Church and in the world this diaconal dimension of our ministry. This liturgical enthroning of the word of God each day during the Council was always for us a gesture of great importance: It told us who was the true Lord of that assembly; it told us that the word of God was on the throne and that we exercise our ministry to listen and to interpret, to offer to the others this word. It is broadly significant for all that we do: enthroning in the world the word of God, the living word, Christ. May it really be him who governs our personal life and our life in the parishes. Now, you have asked me a question that, I must say, goes a bit beyond my strengths: What would be the tasks proper to the deacons of Rome. I know that the cardinal vicar knows much better than I the real situations of the city and the diocesan community of Rome. I think that one characteristic of the ministry of the deacons is precisely the multiplicity of the diaconate’s applications. In the International Theological Commission, a few years ago, we studied at length the diaconate in the history and also the present of the Church. And we discovered just that: There is not just one profile. What they should do varies, depending on the preparation of the persons and the situations in which they find themselves. There can be applications and activities that are very different, always in communion with the bishop and with the parish, naturally. In the various situations, various possibilities arise, also depending on the professional preparation that these deacons could have. They could be committed in the cultural sector, which is so important today, or they could have a voice and an important post in the educational realm. We are thinking this year precisely of the problem of education as central to our future, and the future of humanity. Certainly the sector of charity was in Rome the original sector, because those called presbyters and deacons were centers of Christian charity. This was from the beginning in the city of Rome a fundamental area. In my encyclical “Deus Caritas Est,” I showed that not just preaching and the liturgy are essential for the Church and for the ministry of the Church, but rather equally important is the service of caritas — in its multiple dimensions — for the poor, the needy. 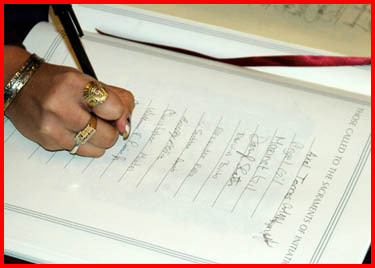 Thus, I hope that all the time, in the whole diocese, even if in distinct situations, this continues being a fundamental dimension, and also a priority for the commitment of the deacons, even if not the only one, as is also shown in the early Church, where the seven deacons were chosen precisely to permit the apostles to dedicate themselves to prayer, liturgy and preaching. Also afterward, Stephen found himself in the situation of having to preach to the Greeks, to the Jews who spoke Greek, and thus the field of preaching was amplified. He is conditioned, we could say, by the cultural situation, where he has a voice to make present in that sector the word of God. In that way, he makes more possible the universality of the Christian testimony, opening the doors to St. Paul who witnessed his stoning, and later, in a certain sense, was his successor in the universalization of the word of God. I don’t know if the cardinal vicar would like to add something; I’m not as close to the concrete situations. Holy Father, I can just confirm, as you said, that also concretely in Rome, the deacons work in many sectors, for the most part, in parishes, where they concern themselves with the ministry of charity; but, for example, many are also involved in ministry to the family. Since almost all of the deacons are married, they offer marriage preparation, give follow-up to young couples, and things like that. They also offer a significant contribution to the ministry of health care; they help also in the vicariate — where some of them work — and as you heard, in missions. There is a certain missionary presence of deacons. I think that, naturally, in the numerical plane, the greatest commitment is in the parishes, but there also exist other sectors that are also opening, and precisely because of this, we now have more than a hundred permanent deacons. On Thursday, I was visited by Vincent Cerasuolo, liaison for the Archdiocese to the Charismatic communities. He has been working with over 50 English speaking communities as well as the Spanish, Brazilian, Haitian and African charismatic communities in the Archdiocese. He spoke to me about their new Statutes. Father Art Coyle oversees the different activities, so he accompanied Vincent. I am very grateful for all that Vincent is doing to promote the charismatic prayer groups, particularly helping them to make sure that they are all united and that they have good communication among them, despite the different languages and ethnic groups. 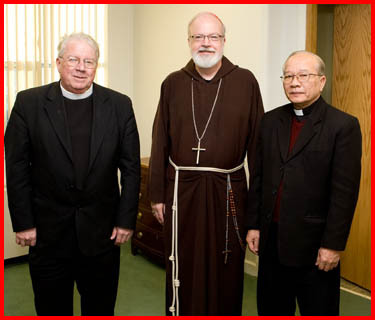 Also on Thursday, I was visited by Bishop Anthony Vu Huy Chuong of the Diocese of Hung Hoa, in Vietnam. He’s been bishop there since 2004. He explained to me that his diocese had been without a bishop for 11 years. When he arrived, he had 25 priests. He now has 50. 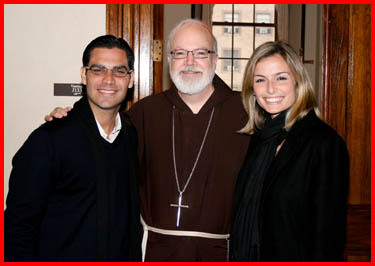 He has two of his seminarians studying with us at St. John’s. The situation is still difficult for the Church in Vietnam, although he sees many signs of hope and improvement. I told him that the Vietnamese Catholic community has been such a blessing for our country In the last few years one tenth of the ordinations in the United States have been Asian priests, most of them Vietnamese, even though they represent a very small percentage of the total number Catholics in the country. 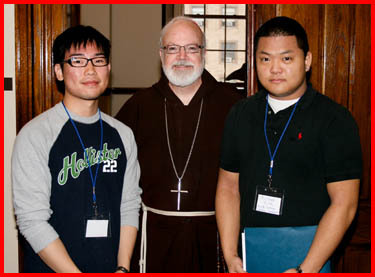 Vietnamese families are sending many men to the seminary, for which I am very grateful. Bishop Anthony has a cousin who lives in the area so we told him we hope that he comes back some day to visit again. I also told him that cardinal Van Thuan, the very famous and holy Vietnamese cardinal, spent quite a bit of time in Boston; he was even operated at St. Elizabeth’s hospital. Bishop Anthony spoke English rather well, quite an accomplishment, because he learned it while in high school. 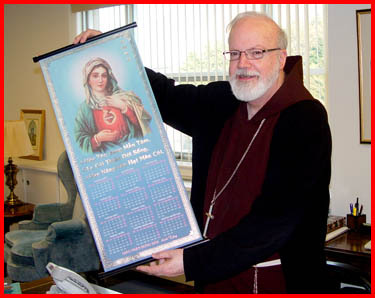 He gave me a lovely calendar from his diocese with the image of the Sacred Heart of Mary. I don’t really understand what is written on it, because it’s all in Vietnamese, but at the bottom is printed the name of his diocese, Diocese of Hung Hoa. That is my photo of the week.